MFM 92.6 Stellenbosch Live Stream . This is a Music radio channel from Stellenbosch, South Africa. 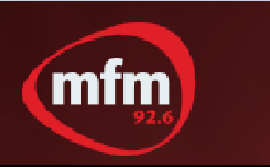 MFM 92.6 is an independent radio station, situated on the campus of the University of Stellenbosch, South Africa. Physical Address : Upper level , Langenhoven Student Centre , Merriman Avenue , Stellenbosch 7600 . Postal Address : MFM 92.6 , P.O. Box 3426 , Matieland 7602 .